Pink Glory, Gray Glory, Primitive Glory, all of these are spaces that offer vintage and antique pieces and all are marked by their beauty. The real glory behind them is my gal pal, Rose, who with her gentle eye for design and expert hunt for unique pieces, fills her spaces with her unique glory. 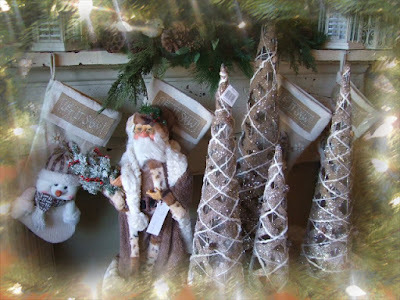 She has just moved two of her spaces into Hodge Podge located in Monroe, Georiga. 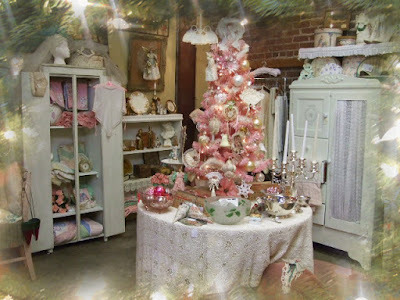 Since Hodge Podge was also having their Holiday Open House, this was the perfect time for me to visit Rose's new spaces. 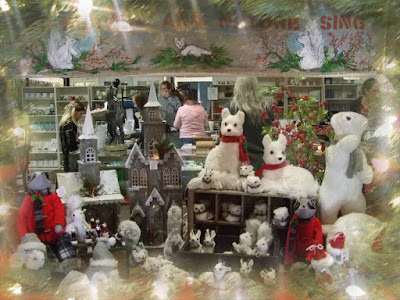 Hodge Podge was filled with holiday shoppers and live music played while we visited pretty dealer booths and ate homemade goodies. Love the clean neutrals in this display. This space offered such pretty mica houses. 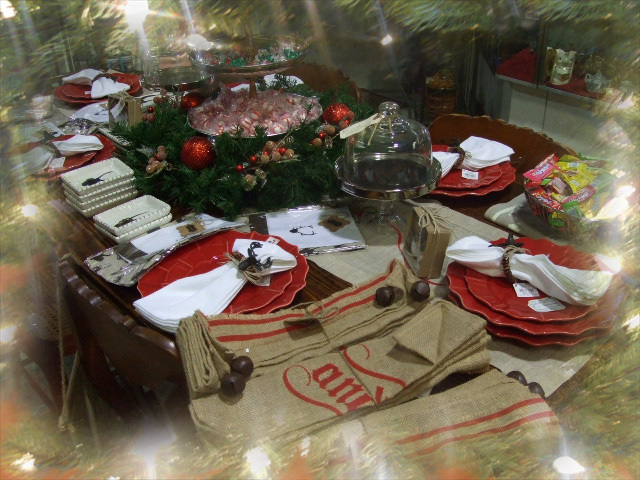 Tables were filled with food and drink for everyone to partake in. Pink Glory, my girlfriend's space is "gloryious". Her space is located in a bright corner and she has loads of space to really spread out. All is calm, all is bright. 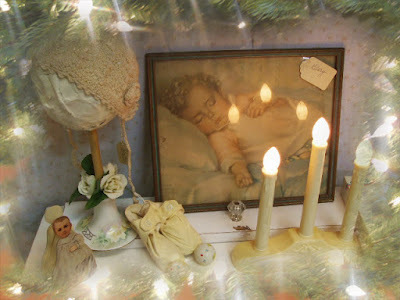 I love this display, precious Bessie Pease Gutmann sleeping baby print is surrounded by sweet vintage baby items. 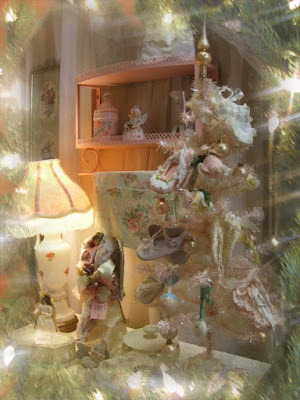 Rose filled a feather tree with infant booties and tiny baby shoes. This tree makes you smile. 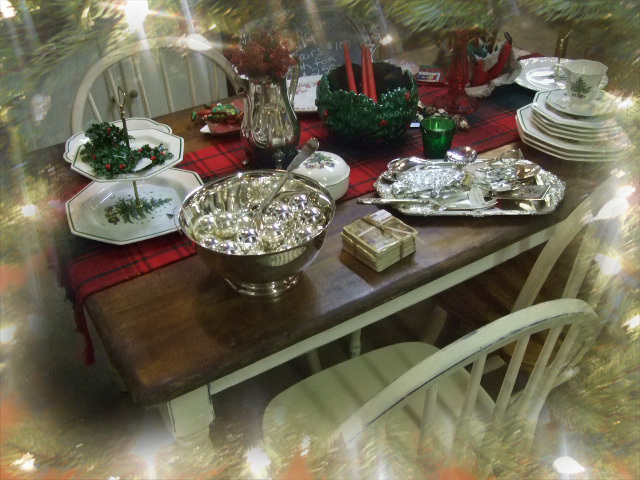 Her other space is "Holiday Glory" and this table welcomes you and your family and friends around a classic holiday table. 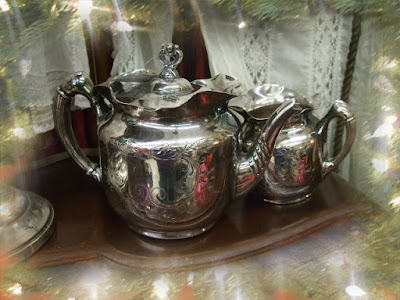 I can't wait until she sets up her Gray Glory space because it is usually filled with gorgeous silverplate. I have found so many great pieces from her spaces and I am going to have to make more frequent trips to Monroe. In between the Hodge Podge Holiday Open House, I found a little time to hunt for treasure and refluff my spaces at the Buford Queen of Hearts. 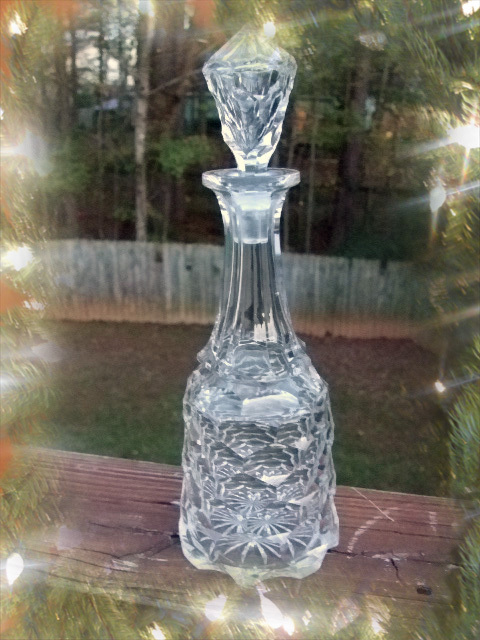 Stopped by one of my favorite thrift stores for unusual finds and found this gorgeous cut crystal decanter. Early American Pressed Glass (EAPG) seems to be popping up everywhere these days and I'm over the moon with delight with that. This gorgeous, lidded compote has a kiss of sun purple to it and is now in my personal collection. 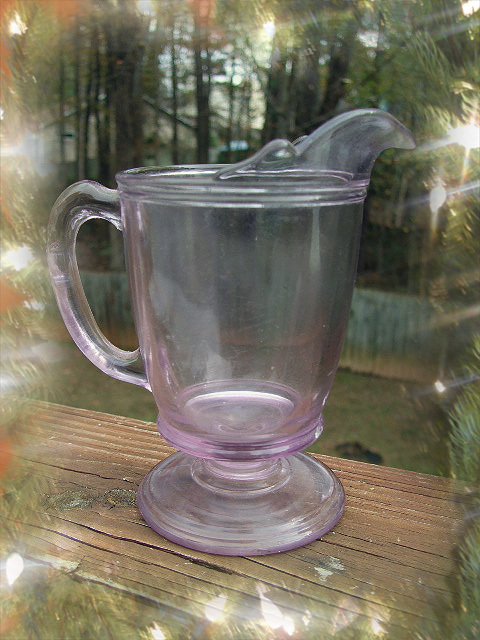 Another pretty sun purple EAPG footed cream pitcher was a Davis Street Antiques find. A fantastic find and one of the most popular prints that was found in boys room during the early 20th century. Original litho print, "Appeal to the Great Spirit" print is from the 1920s and in the original frame. 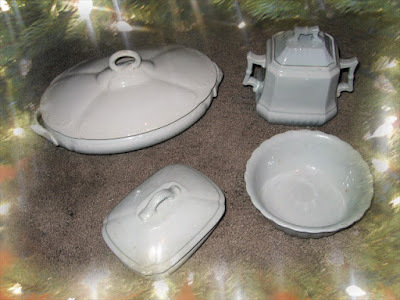 I fell into a table full of antique whiteware ironstone from England and I grabbed it all. These will be in my Victorian space at the Buford Queen of Hearts next week. 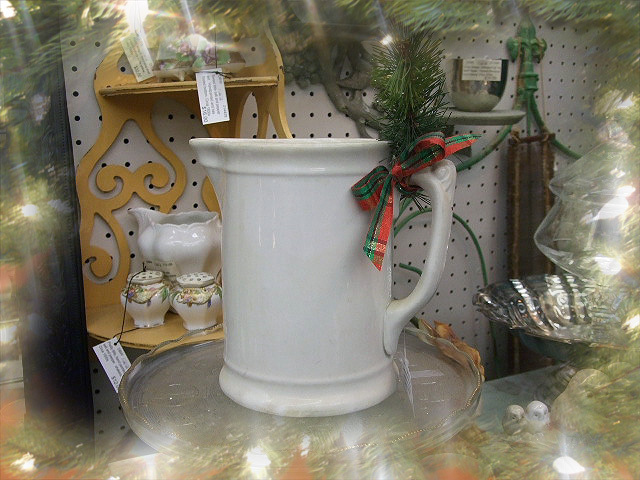 Fantastic antique whiteware ironstone pitcher was part of that find. 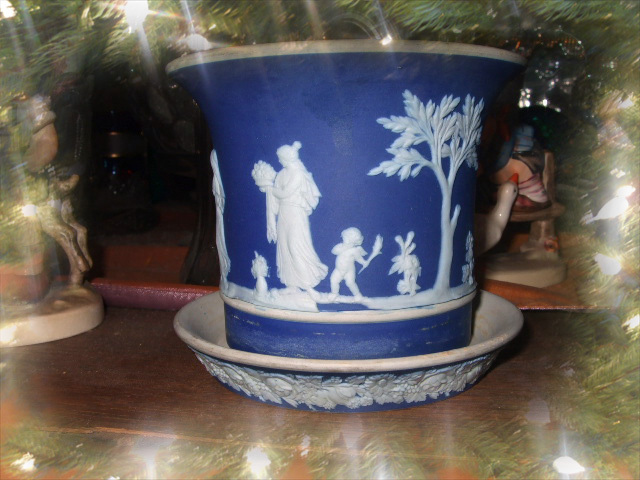 A sweet, Wedgwood blue jasper flower pot and base was a Hodge Podge find. 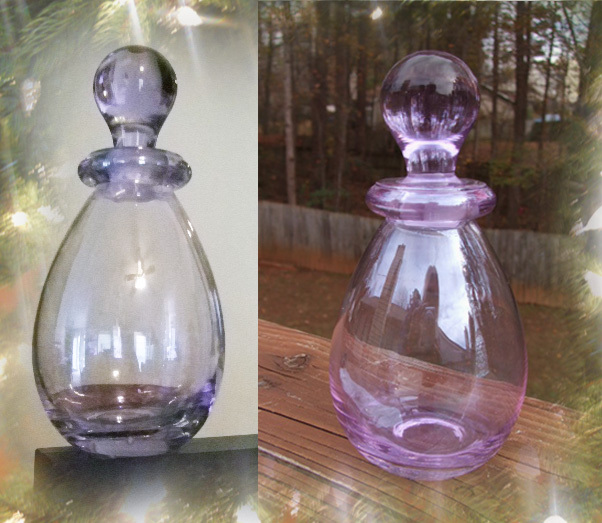 A thrift store find, gorgeous piece of Alexandrite glass. Changes color and is a rich pink in natural light but turns a blue plum color under florescent light. This Victorian quad plate teapot and creamer were black with tarnish but they polished up a brilliant silver and look like they have never, ever been used. Another tarnished black piece. 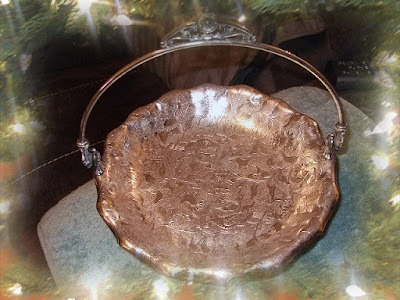 Victorian wedding basket is now shiny and bright and in my quad display case. Pretty pair of flow blue pieces. Covered sugarbowl and gravy boat and spill tray. Made in England and pattern is Venus. Terrific Gibson Girl print in oval wood frame. 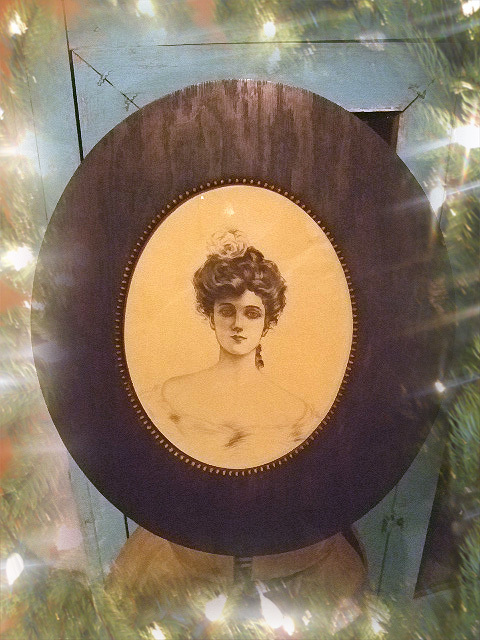 She is lovely and will be in Victorian space next week. 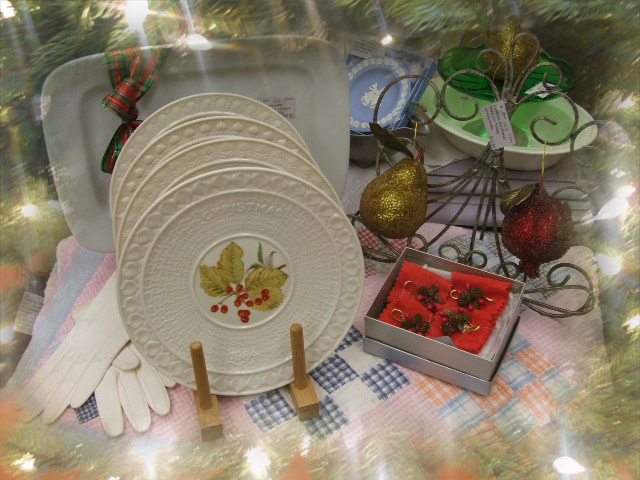 Brought in these lovely Belleek Christmas plates showcasing Irish flora. Gorgeous red embroidery on white feed sacks summer quilt. 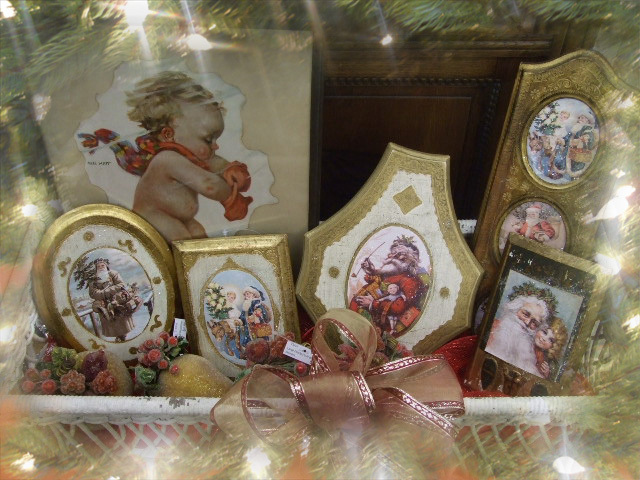 Finally, I took the last of my box lot of vintage Florentine plaques and added vintage Santa's to them. 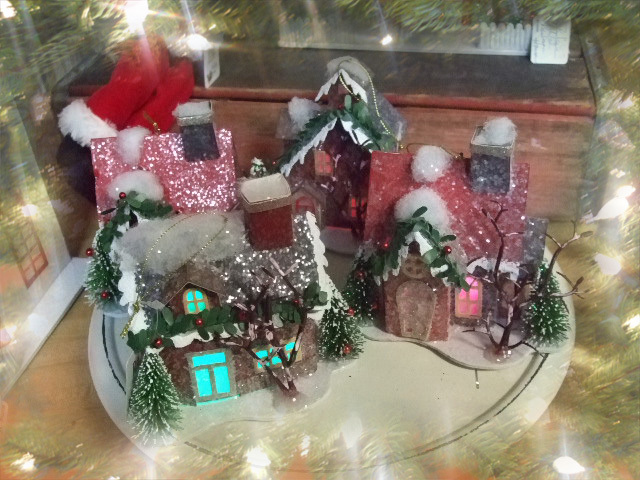 A little bit of mica glitter and they are darling Christmas decorative elements. Can you believe how quickly this month is moving? Thanksgiving will be here in two weeks and Christmas not to far behind. 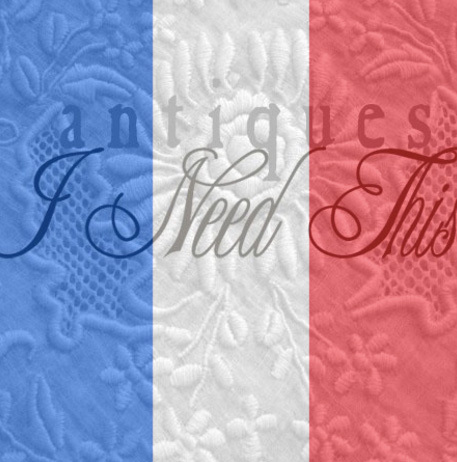 These holidays are a time for family and friend to come together in fellowship, love and care and my wish, in light of the ugliness that has been perpetrated on France, is that we care for one another. Kindness costs us nothing and everyone is richer from the act. 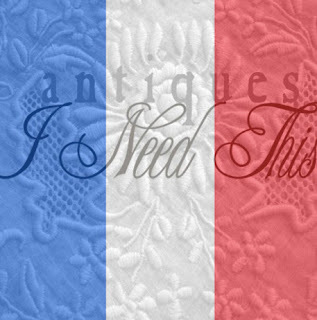 Blessings to you and those you love and especially to the hearts in France. Yes, my hunt for an antique cupboard has reaped a lovely piece and an interesting story. About ten days ago, I saw a post on one of my favorite locations for treasure, Vintage Village in Snellville, GA, so I sent a message inquiring about the size and the price. Debbie contacted me right away to say that it never even made it off the dealers truck. It was sold, sigh so I took off for Virgina to visit my grandchildren who recently moved from Anchorage, Alaska back to the lower 48. 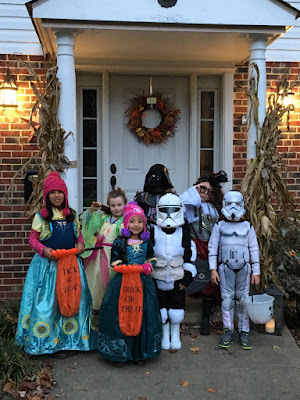 Halloween is a favorite holiday and all three had requested costumes from grandma-ma. The Con-man requested a Scout Trooper costume. 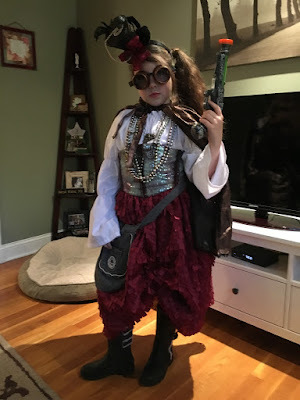 And Kit Kat, designed her costume, Steampunk Ocean Warrior. 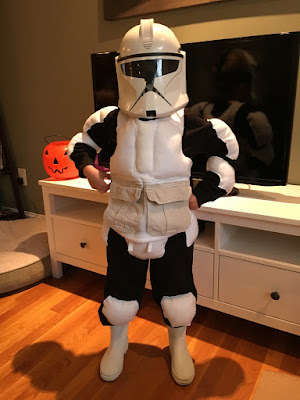 Grandma-ma took her concept and put this together. 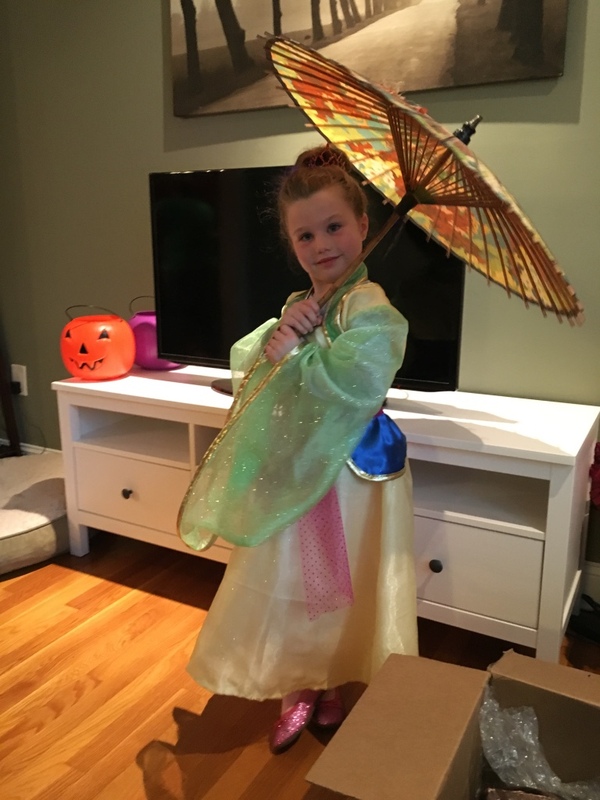 She is working it. We couldn't have asked for a better day, beautiful autumn weather and neighborhood friends made it a fun evening. 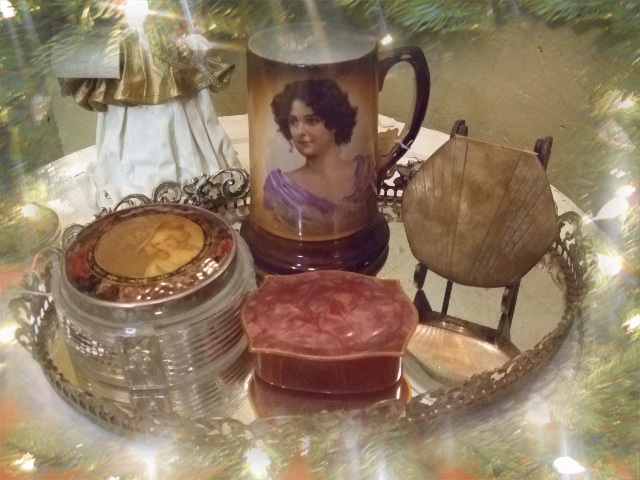 Even made a short trip to a local thrift store in Springfield and I came home with some treasure. But the real story is after I returned home, I see a facebook message from a gal pal dealer and author. Barbara and I have taste that is so equal you would think we were twin sisters. We could shop for each other without a list and each pick up the same item for the other. Seems that pretty cupboard that I was interested in was purchased by Barbara. Once she got it home it was too big for her space so she inquired if I was still interested in it. Hot damn dog, you bet I am. Got the measurements and it had the depth I was looking for as I wanted to put one of my spinning wheels on the top for display and open up my floor space. (I have three spinning wheels that I use so they use up real estate. So off to Decatur on a rainy Friday afternoon and this beauty is waiting for me. Now, the cuboard is heavy and a home made piece, Circa 1920s. At one time it was actually used as a wardrobe as their is a hand hewn wooden bar across the top fo clothing. It has old, black screens on the front doors and the original, removable shelving (three boards for each shelf). Shelving is layered with white and aqua green paint over the years and has a marvelous patina. Outside paint was a very chippy white that was dropping paint drops as I touched it. So, I gave it a light sanding and then worked a beachy aqua paint into it. Then a final sanding to release some of the original white paint under it and show the heavily worn wood in spots. I love the way this turned out and no more lead paint chips on the carpet. I put my Scottish Castle spinning wheel on top along with a few antique American baskets, a mantle clock and jug. 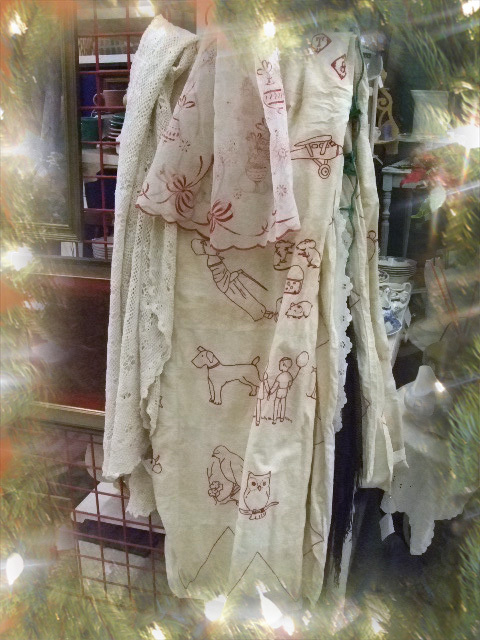 Oh, while I was at Barbara's I commented on the antique dress form as well. 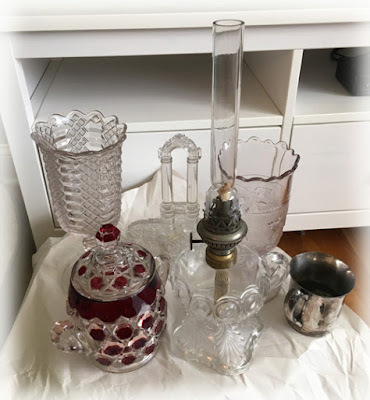 She sold that to me too, and wouldn't you know, this was a piece she purchased along with the cupboard from the same dealer, Sweet T. So these pretty pieces made their way from Snellville to Decatur to Lawrenceville, kinda like an Antique Triangle of treasure. 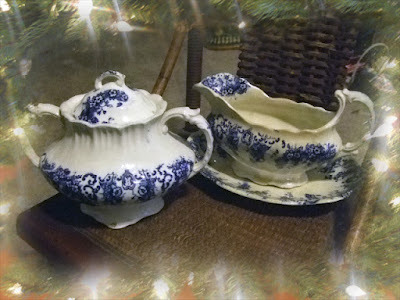 Did a little more treasure hunting on Saturday and found this pair of adorable, Shirley Temple prints. 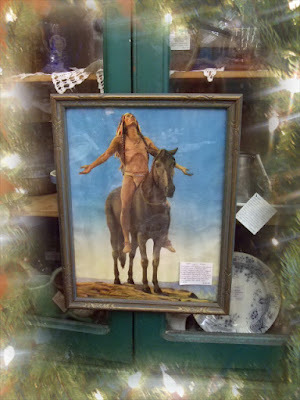 This lovely Jemez piece went straight into my personal collection. The Buford Queen of Hearts will be holding their Holiday Open House starting Thursday, Nov 12 so I had to get my spaces decorated. I decorated this antique beaver top hat for the season. 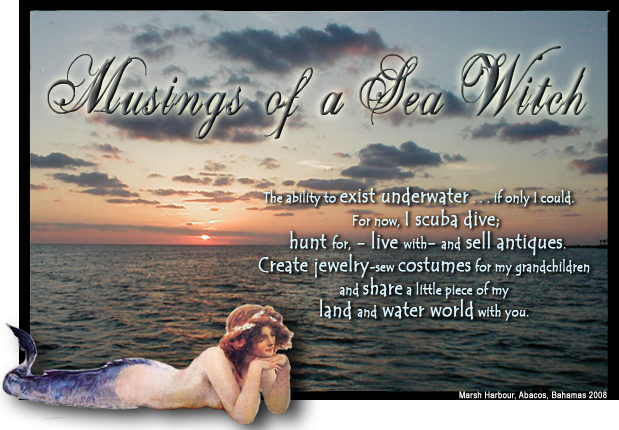 You can wear it or use it as a decorative element. Love the David Copperfield, Christmas Story look to it. 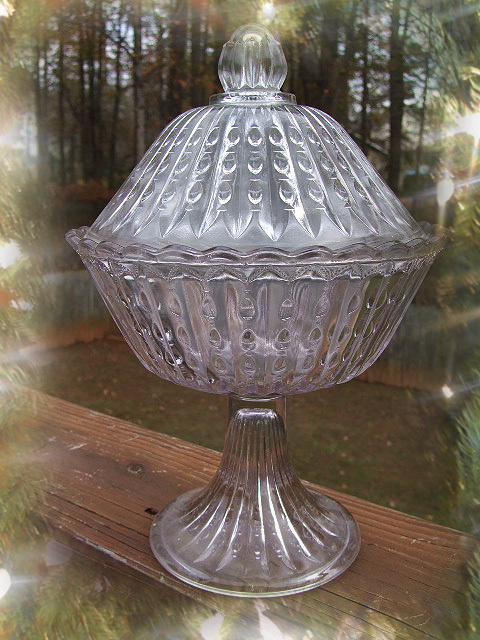 The color red is king over the holidays and the lovely cut to clear crystal decanter is a beauty and looks lovely next to the EAPG covered sugar bowl. Everybody loves snow babies and these are in my main space looking for a home to live in. Beaded fruit sparkles in the holiday light. Gorgeous EAPG covered compote will be in my space next weekend.